The Canadian government is signaling that it’s going to appoint Indigenous members to the board that decides on pipeline projects. The move would shake up the composition of the National Energy Board, which is dominated by former oil and utility company executives. “The National Energy Board should be more reflective of the diversity of the country, including and particularly Indigenous cultural background and perspective,” Carr told the Indigenous and Northern Affairs committee. Carr said the same applies to the temporary members the government plans on appointing to help review the Energy East proposal. “Through the appointment of new temporary members to the board [we know] that Indigenous background issues are important,” Carr said. Carr was speaking in the context of the Liberal government’s promised reforms of the NEB. Before the federal election, Justin Trudeau promised to “put some teeth” back into the regulator, the Canadian Press reported. Carr’s ministerial mandate letter instructed him to reform the NEB so that its members have better knowledge of Indigenous issues, among other things. The NEB has been criticized for its lack of diversity and failing to sufficiently consult the communities, including Indigenous ones, that would be affected by proposed pipelines. “We’re opening up the important reform of the National Energy Board and environmental assessments in Canada generally speaking to what we hope is a robust, important Canadian chat about that,” Carr said. For me, the scariest signal yet sent by the Trudeau government was bringing English “deliverologist” Sir Michael Barber, to their Alberta cabinet retreat, to tell them how they’re doing. They imported a British con man who was a perfect accessory during the Blair years, and — now that slippery Tony is gone, replaced by the rawer, more authentic Jeremy Corbyn — he moves on to the colonies. Barber has delivered his spiel in Australia, the Punjab and Maryland. Are we impressed to be in that company? It’s an early warning sign that the Trudeau folk are starting to believe their own BS. I’m not particularly against BS, everyone in power deploys it; the danger point comes when you start gulping it yourself and not just spooning it out to others. That’s when the vultures start swanning around the retreats. CBC’s Terry Milewski interviewed colleague Rosie Barton, who was on site, re: the scam. Rosie seemed dubious but said the Brit told his marks they were doing rawther well. Terry, sounding like a true rube, i.e., someone who has no idea that’s what he is — or a candidate for Private Eye’s pseuds corner — said he counts on Rosie for hip terms like deliverology. It’s about as fresh as the 500 channel universe. I happen to own a copy of Barber’s Deliverology 101, from 2011. I won’t say I read it, it’s not really meant for that, but I sort of flapped through it once. It’s loaded with charts, checklists, bullet points: nobody reads these things but they’re meant to make you feel like a practical, can-do type, not someone who wastes time on books — a profile rife in the upper regions of education administrators, who happen to be Barber’s natural habitat. I’ve avoided defining deliverology because it doesn’t actually exist. It’s just mouthfuls of verbiage. Barber told Paul Wells of Maclean’s, at an earlier cabinet retreat, that he’d been recruited to “the prime minister’s delivery unit” in order to rescue Blair’s government. “It’s not tremendously exciting, but it’s really important, getting the priorities, the definitions of success, the trajectories, the data” — I should’ve said gobfuls of verbiage. You could do a close analysis of his language to show how vacuousness is literarily constructed but it seems to hypnotize people like Wells, who views himself as deeply skeptical. If a Canadian talked in such vapours, Wells would shred him. What is it — the accent? No surprise, given the Conservative party’s use of identity politics in the election and explicit anti-Muslim messaging. Muslim Canadians voted overwhelmingly for the Liberal Party in last year’s election, helping Justin Trudeau secure the majority government that nine out of 10 of Muslims believe will help improve relations between themselves and other Canadians, according to a new survey. The Environics Institute polled 600 Muslim Canadians between November 2015 and January 2016, asking a number of questions related to identity and religious issues, in addition to more politically themed questions. Of those who said they had voted in the 2015 federal election, 65 per cent reported voting for the Liberals, with 10 per cent saying they voted for the New Democrats and just two per cent for the Conservatives. Another 19 per cent of Muslim respondents refused to say how they had voted. The Liberals did particularly well among Muslims in Quebec and those who are Canadian born. The NDP did slightly better among younger Muslims than it did among older Muslims. These numbers mark a shift away from the NDP and Conservatives compared with 2011. An Ipsos Reid exit poll of voters in 2011 found that 46 per cent of Muslim Canadians had voted for the Liberals, with 38 per cent having cast a ballot for the NDP and 12 per cent for the Conservatives. Her latest project, Migrant Dreams, will do just that. Premiering at Toronto’s Hot Docs festival on May 1, the film explores the dark side of Canada’s Temporary Foreign Worker Program (TFWP), a controversial federal initiative that allows companies—from hotels to fast-food restaurants to slaughterhouses—to hire out-of-country employees when they can’t find willing Canadians to do the work. A story of abuse and exploitation in the heart of tomato country, the documentary evokes anything but national pride. In existence (in one form or another) for more than four decades, the TFWP was created to address critical labour shortages in particular sectors. Simply put, if an employer cannot find a Canadian to do a certain job, it can ask Ottawa’s permission to contract a provisional worker from abroad, for a maximum stint of four years. The government will then conduct a Labour Market Impact Assessment (LMIA) to confirm that a Canadian can’t be found to fill the opening. At this moment, more than 60,000 foreigners are working in Canada under the TFWP. In 2013, Stephen Harper’s government announced major changes, giving the feds more power to suspend work permits if employers abuse the program, and requiring companies to have a “firm plan” to eventually transition to a Canadian workforce. Further reforms followed, including fines ranging from $500 to $1 million for “misuse” of the TFWP. “Our government is committed to ensuring that Canadians are always considered first for available jobs,” the Tories proclaimed. As strife in the Middle East continues to make headlines, from the militant group ISIS to Syrian refugees, the Muslim world is sharply divided on what the relationship should be between the tenets of Islam and the laws of governments. 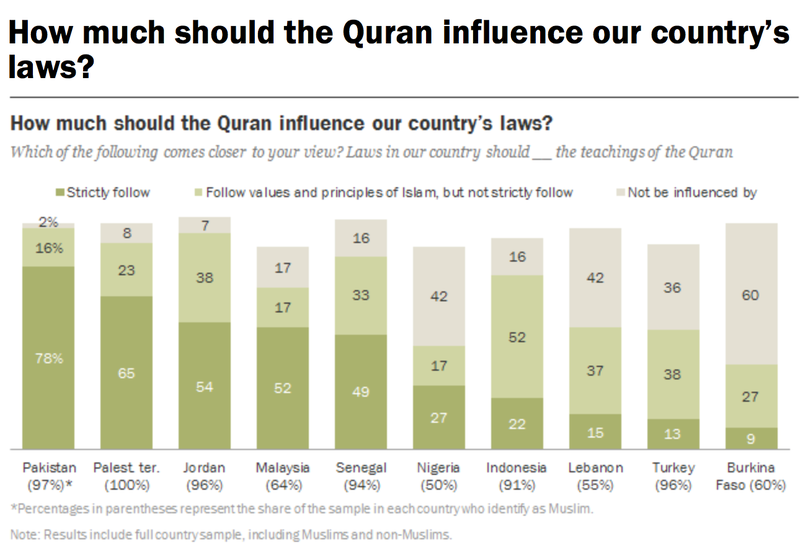 Across 10 countries with significant Muslim populations surveyed by Pew Research Center in 2015, there is a striking difference in the extent to which people think the Quran should influence their nation’s laws. 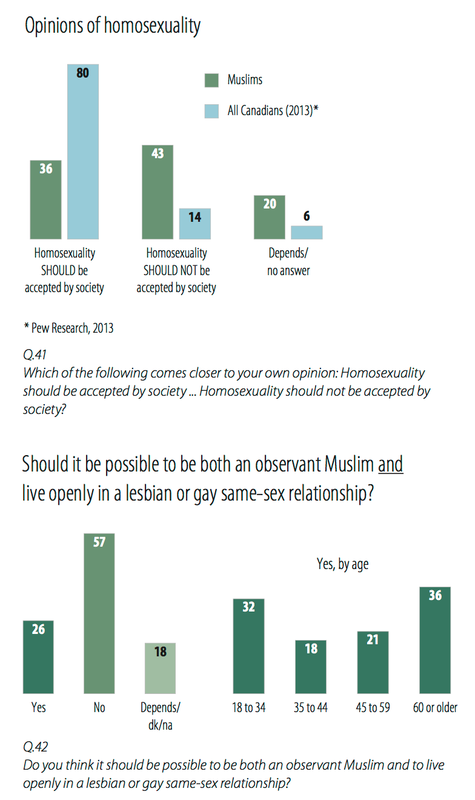 Our survey found that young Muslims are often more religious than their immigrant parents. For many, their religious identity is becoming more important to them – not less. At the same time, Canadian-born Muslims are now among the most likely to believe their community wants both integration and to remain distinct, suggesting the development of a unique “Canadian Muslim identity.” More than 90 per cent of young Muslims believe that “other cultures have a lot to teach us; contact is enriching.” Canada promises freedom of religion and young Muslims appear ready to take up this constitutional offer. Interestingly, while religious practice and identity remain salient, other values change. A big one is patriarchy. In Muslim households, as in most other Canadian families, gender roles are becoming more equal. In our 2006 survey, 70 per cent of Muslims strongly agreed “that taking care of home and kids is as much a man’s job as a woman’s.” In 2016, that number is up to 76 per cent. 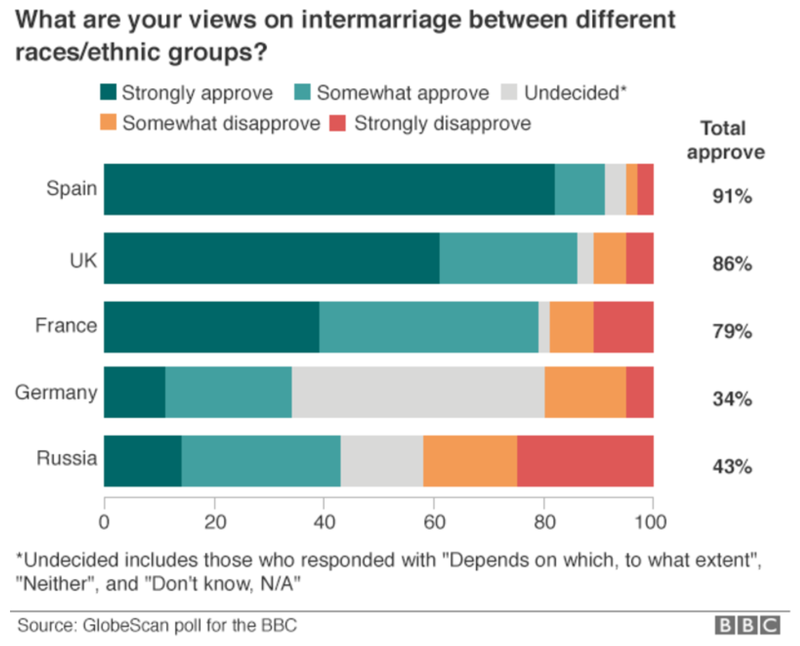 Among those born in Canada, more than eight in 10 reject the notion that the “father in the family must be the master in his own house,” signalling value convergence over time between many in the younger Muslim community and the broader Canadian society. Modernization and secularization evolve in different ways in different countries as majorities and minorities interact; groups can fight each other, or they can accommodate. Canada has the aspirational ideology of multiculturalism, as well as the policy framework that goes by the same name. Neither inoculates against discrimination or injustice, but if we look at public attitudes, citizenship acquisition among immigrants and minority representation in our legislatures, it seems that ours may be the worst system in the world, except for all the others. Muslims report positive feelings toward Canada and non-Muslim Canadians are more likely to have positive impressions of Islam than negative ones. As well, the more Canadians report encountering Muslims in daily life, the more positive their impressions: familiarity breeds good feeling, not contempt. These findings may explain why we see so little conflict between Muslims and other Canadians; when such conflict does erupt (as when a hijab-wearing woman in Toronto was harassed last fall), public figures are unanimous in their condemnation. The data may also help to explain why Canadians, in sharp contrast to Americans, have been so supportive of accepting Syrian refugees by our government and through private sponsorships. These numbers are the big picture against which the news of the day unfolds. They offer an empirical grounding against which individual incidents – stories of harmony or harassment – can be judged as typical or unusual and they serve as a useful corrective to inflammatory anecdotes and stereotypes. Whatever the headlines of the day, the deeper story is that Muslims are proud to be Canadian and they appreciate the same things about Canada that other Canadians do. Great summary of his book by the author. Being good at managing the blame game matters a great deal in the Ottawa bubble and in the national media, but less so elsewhere. Adding oversight bodies and rules and regulations has made the federal public service not only thicker but also more Ottawa-centric. Other than opposition politicians calling for still more oversight, no one is happy with the incessant calls for more rules and regulations. Morale in the federal public service has plummeted and surveys reveal that citizens are unhappy with the quality of public service. One can only applaud the Clerk of the Privy Council’s recent call for public service to be better at taking risks, delivering front-line services, and producing change and making it stick. To give life to this call, the government will have to revisit the many layers of oversight bodies and accountability requirements put in place over the past 15 years. Unless this is done, management reform efforts in the federal government will continue to give the appearance of change, while actually standing still. Was pleased to see my book, Policy Arrogance or Innocent Bias: Resetting Citizenship and Multiculturalism, cited for its examples of the political level asserting its control over policy. In these richer nations, the concept of global citizenship appears to have taken a serious hit after the financial crash of 2008. In Germany, for example, only 30% of respondents see themselves as global citizens. While Germany’s politicians are loudly debating whether Islam is compatible with democracy, five of its state universities are quietly developing pioneering new Islamic theology faculties to try to ensure that it is. The five universities — in Muenster, Osnabrueck, Frankfurt, Tubingen and Erlangen-Nuremberg — recently passed their first official evaluations by Muslim and Christian experts and were granted 20 million euros (or $22 million) to continue for another five years. The programs now have a total of over 1,800 students and plan to grow. The largest program, in Muenster, has 700 students in its three-year bachelor’s program and received more than double that number of applicants this academic year alone. Their example has been such a success that Berlin decided to introduce Islamic theology at one of its universities, even though it will not get federal funds for it. The practical approach these faculties have taken towards training Muslim religion teachers, conducting research into Islam and fostering interfaith dialogue contrasts sharply with the increasingly shrill declarations coming from Germany’s far-right, especially the Alternative for Germany party. The party will hold a convention April 29-30 to agree on its new platform. Its deputy leader, Beatrix von Storch, said Islam violates Germany’s democratic constitution and its public symbols such as minarets, muezzins (people who call Muslims to prayer) and full-face veils should be banned. Johanna Wanka, Germany’s federal minister for education and research, struck a different tone in January when she approved the renewed funding for the five theology centers. German state schools have religious education classes that students attend according to their beliefs. Instruction in the majority Protestant and Catholic faiths are available countrywide and a few areas also offer Jewish education. With the growing number of Muslims in Germany, four states have introduced regular Islamic education for their Muslim public school students. The courses need university-trained teachers, so some universities had to start offering academic programs in Islam. The faculties teach standard courses on the Quran, Islamic law and classic Muslim philosophy, as well as Arabic and pedagogy. Marrying traditional Islamic learning with German academic standards has not been easy. Muslim associations like DITIB, the local arm of Turkey’s Religious Affairs Department that runs mosques and employs imams around Germany, have a say in hiring professors. They have rejected or opposed some candidates they thought were too liberal. But the universities insisted Islam had to be subject to the same critical approach as any other subject and academics must be able to do research and publish freely. Conservative guardians of Muslim tradition have some reason to be wary. German theologians developed the historical-critical method of biblical scholarship in the 18th and 19th centuries, an approach most Islamic scholars have resisted because they view such analytical methods as undermining the faith. If Islamic theology faculties followed this example, some conservatives worried, they could become hotbeds of heresy spreading a reformist Islam unfit to teach to young Muslims. In Muenster, Muslim groups led a bitter campaign against the faculty’s director Mouhanad Khorchide, who received several death threats and was given police protection. But the university stood by him and the criticism eventually ebbed. The Lebanese-born son of Palestinian refugees, Khorchide, 44, has irritated conservative Muslims with popular books such as “Islam Is Mercy” and “God Believes in People,” and appearances on German talk shows where he is treated like the new spokesman for Islam. He speaks out clearly against the ultra-conservative Salafi Muslims, who have a tiny but growing following among young German Muslims, and call for Shariah to be the law of the land. Près de la moitié des immigrants choisis par le Québec pour répondre aux besoins du marché du travail partent pour d’autres cieux si, à leur arrivée, ils parlent l’anglais mais pas le français. C’est ce que révèle une analyse, datée de juin 2015, de la Direction de la planification, de la recherche et des statistiques du ministère de l’Immigration, de la Diversité et de l’Inclusion (MIDI). Ainsi, dans la catégorie de l’immigration économique, c’est-à-dire les candidats sélectionnés en raison de leurs qualifications professionnelles, 46 % des immigrants admis entre 2004 à 2013 et qui ne parlaient que l’anglais (en plus, souvent, de leur langue maternelle) avaient quitté le Québec en 2015. À des fins de comparaison, 84 % des immigrants qui connaissaient le français mais pas l’anglais à leur arrivée restent au Québec. Ce pourcentage baisse à 73 % pour les immigrants qui parlent à la fois le français et l’anglais, et à 68 % pour les nouveaux arrivants qui ne connaissent ni l’une ni l’autre de ces langues. Si on se fie à ses données, miser sur des immigrants dont les qualifications professionnelles sont élevées, mais qui ne connaissent pas le français, comme le souhaite le milieu des affaires, n’est peut-être pas une stratégie gagnante. Lors des consultations sur le projet de loi 77 sur l’immigration en février, le Conseil du patronat du Québec (CPQ), la Chambre de commerce du Montréal métropolitain (CCMM) et l’Association des manufacturiers et exportateurs du Québec (AMEQ) ont tous plaidé pour un allégement des exigences en matière de connaissance du français pour privilégier l’adéquation entre les compétences professionnelles des candidats et les besoins du milieu du travail. Ainsi, l’AMEQ a demandé qu’on permette aux employeurs d’embaucher des travailleurs immigrants qui ne connaissent pas le français afin de contrer les pénuries de main-d’oeuvre. D’une façon globale, le quart des 50 000 immigrants qu’accueille le Québec — ou 12 500 personnes — choisit de partir, le plus souvent pour s’installer dans les autres provinces canadiennes. Paradoxalement, ce sont les immigrants sélectionnés par le MIDI qui sont les plus susceptibles de quitter le Québec — près de 30 % d’entre eux s’en vont — même si ce sont les mieux outillés pour se trouver un emploi. Les réfugiés, qui ne sont pas sélectionnés en fonction de leurs compétences professionnelles, mais pour des motifs humanitaires, sont plus nombreux en proportion à rester : 80 % d’entre eux le font. La provenance des immigrants importe. Les deux tiers des immigrants sélectionnés en provenance du Pakistan s’en sont allés, le même pourcentage ou presque que celui des immigrants de l’Inde. Seulement la moitié des immigrants en provenance de Chine et d’Iran choisissent de s’établir ici. Selon Stephan Reichold, de la Table de concertation des organismes au service des personnes réfugiées et immigrantes (TCRI), deux raisons peuvent expliquer que des immigrants admis au Québec décident de s’installer ailleurs au Canada. Ils peuvent avoir dans d’autres provinces de la famille et des amis qui les invitent à les rejoindre. Ou encore ce sont les circonstances économiques — le chômage — qui les incitent à partir. M. Reichold a cité l’exemple de réfugiés du Bhoutan, installés dans la région de Joliette, qui s’en sont allés faute d’emplois. « Ils ne sont pas partis de gaieté de coeur. Ils aimaient la qualité de vie au Québec », a-t-il relaté.